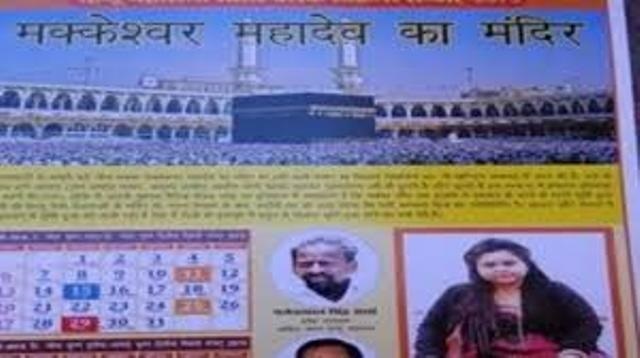 The Hindu Mahasabha, Aligarh, on Sunday released a controversial Hindu New Year calendar in which seven mosques and monuments from the Mughal era, including the Taj Mahal, and the holy Muslim site of Mecca, have been referred to as ʹHindu templesʹ. While Taj Mahal has been referred to as ʹTejo Mahalaya templeʹ, Mecca has been called the ʹMacceshwar Mahadev templeʹ. Similarly, Madhya Pradeshʹs Kamal Maula Mosque has been referred to as ʹbhojshalaʹ and Kashiʹs Gyanvyapi mosque has been called the ʹVishwanath templeʹ, Qutab Minar ʹVishnu Stambhʹ, Jaunpurʹs Atala mosque ʹAtla devi templeʹ and the demolished Babri Masjid in Ayodhya as ʹRam Janam Bhoomiʹ. ʹWe have organised ʹhawanʹ rituals on the auspicious New year of the Hindu calendar and resolved to make this country a Hindu Rashtra,ʹ said Hindu Mahasabha national secretary Pooja Shakun Pandey. ʹThey should now have to give these back to Hindus and we will restore their original names, as mentioned in the new calendar,ʹ she added.